New Japan announces the blocks for the G1 Climax with many big matches, AJ Styles lands the cover of WWE 2K19, Women of Wrestling (WOW) strikes a television deal for 2019, WWE at Royal Albert Hall, the '24' special on The Hardys, POST Wrestling's schedule this week & lots more. **Wai Ting and I have a lengthy review of the WWE Money in the Bank card from Sunday night that can be downloaded from the site. We went through the good and the bad from the show, lots of feedback to the event, Braun Strowman and Alexa Bliss winning the briefcases, Ronda Rousey’s performance and the booking of her match with Nia Jax, and tons more covered on the show. Our review of Money in the Bank can be found on the POST Wrestling feed on iTunes, Google Play, Stitcher, Spotify and wherever you listen to podcasts. **If you missed it, Braden Herrington & Davie Portman of upNXT have a comprehensive rundown of the NXT TakeOver Chicago II card from Saturday night, featuring Johnny Gargano vs. Tommaso Ciampa in a Street Fight at the Allstate Arena. **We will be back tonight with Rewind-A-Raw to chat tonight’s episode of Raw, the fallout from Money in the Bank and we will also go over the G1 participants and block announcements as well as take your feedback. For those that are members of the POST Wrestling Café, we will have our special RAR Overrun show with Wai Ting reviewing Total Bellas and we will also chat the WWE 24 special on The Hardys that aired Sunday. If you are a member at any tier of the POST Wrestling Café, you will get the RAR Overrun show. **On Friday, we are back with a new Rewind-A-Wai and reviewing the 1991 pilot ‘Tag Team’ starring Jesse Ventura and Roddy Piper as cops. This was chosen by Espresso Executive Producer Kris from L.A. and he will join us to discuss his selection. You can watch the pilot and provide feedback on the POST Wrestling Forum. **I wanted to mention that on Saturday, we will be launching a new series from Chris Charlton, who is about to release his new book “Eggshells” on the history of wrestling at the Tokyo Dome. Charlton will begin a companion series of podcasts covering each year of wrestling at the Tokyo Dome with the first podcast dropping this Saturday at POST Wrestling and will be free for everyone. The first show focuses on the year 1989 with Charlton joined by Jojo Remy. -The B Block looks stacked from a quality standpoint with Omega, Ibushi, Naito, ZSJ, Ishii along with the likes of Robinson, Goto, and Sanada who should step up and have big showings with the quality of opponents. Toru Yano is there for a different style of match and when you’re watching so much great wrestling, it’s a good role to have and a nice break to the breakneck pace of the tournament. -The A Block should be a huge launching pad for Jay White and Hangman Page to work with some incredible opponents and standout on their own. 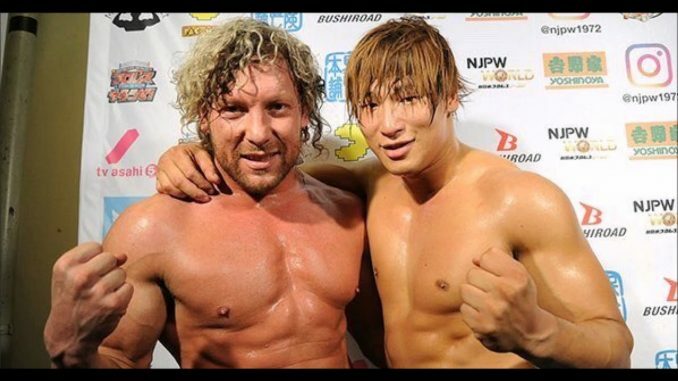 Tanahashi will probably pace himself, especially for the big matches with Okada and Suzuki. Fale always gets a lot of wins in the tournament and is protected so he should get some upsets early. I’m not crazy about Yoshi-Hashi being involved as the microscope will be on him and Tama Tonga throughout. -Togi Makabe seems to be in the role Yuji Nagata, Satoshi Kojima and Hiroyoshi Tenzan held as the elder statesmen that can still go for some big matches. I don’t know how many G1s Makabe has left after this year. **Every G1 card will be broadcast in English this year for New Japan World. **Tonight’s episode of Raw takes place from Grand Rapids, Michigan coming off Money in the Bank. The next major show is Extreme Rules on July 15th in Pittsburgh. Sunday’s show felt like the conclusion of several programs, including Roman Reigns vs. Jinder Mahal and Bobby Lashley vs. Sami Zayn. The major news from Sunday’s show was Alexa Bliss winning the Raw women’s title and the directions that set up for Bliss, Nia Jax, and Ronda Rousey. I feel there was strong interest coming out of Sunday’s show and the booking direction for Rousey heading forward. **The SmackDown crew is in Fort Wayne, Indiana with AJ Styles vs. Shinsuke Nakamura advertised for the main event. The television tapings are in Toledo, Ohio on Tuesday. **AJ Styles will be on the cover of the WWE 2K19 video game that will be out later this year. The news was first reported by Ryan Satin at Pro Wrestling Sheet prior to today’s announcement by 2K and the WWE. A press conference took place Monday with Styles on hand to answer questions. There will also be a promotion where a player can win $1 million beating a to-be-announced mode in the video game, cut a promotional video on why they can defeat AJ Styles in the game and then go through a mini-tournament to play Styles for the chance to win the prize. WWE 2K19 will be released on October 9th. **The WWE has added a North American title match between Adam Cole and Wolfgang to Tuesday’s card at Royal Albert Hall. **Here are the matches for Tuesday’s Kizuna Road card from Korakuen Hall at 5:30 am Eastern on New Japan World. The show will feature the announcement of the main events for the G1 cards. **AXS TV has announced a deal with WOW (Women of Wrestling) to begin shooting episodes later this year and premiere on AXS in 2019. WOW was revived by Jeanie Buss, Mark Burnett, and David McLane. McLane, who was heavily involved with GLOW, formed WOW alongside Buss in 2000. The promotion staged an infamous live pay-per-view in February 2001 that was built up through their syndicated television series. The promotion went dormant and was revived in 2014 with digital episodes produced for YouTube and their website, which has the 10-episode fourth season available for free at www.wowe.com. WOW will join New Japan Pro Wrestling as the two wrestling properties on AXS TV. **The WWE’s ‘24’ special on The Hardys premiered on the WWE Network on Sunday following Money in the Bank. It is way more revealing than most WWE specials that will either shy away from certain realities that exist within the industry. There is a fair amount spent on both Matt and Jeff’s drug dependency issues where they start focusing on the problems in 2009 when Jeff was leaving the company and Matt was spiraling downward and remained with the WWE for another year. There is some unbelievable footage caught on camera from Matt falling asleep during a sit-down interview, and a frank discussion between Matt and Jeff on their property with Jeff’s wife, Beth, informing them they have microphones on and to be careful as the two laughed about it. The special does address Jeff’s recent DWI from March with Matt admitting how mad he was and didn’t speak to Jeff for 24 hours. Jeff stated that he does see a counselor and it was attributed to Jeff being in his own head a lot with Matt adding that, “Jeff still worries me.” The DWI portion felt like it needed someone representing the company to speak on it as it came off as someone with a long history of dependency problems, falling off the wagon and getting behind the wheel and then we cut to Jeff’s rehab of his shoulder and return to television one month after the arrest. **We didn’t have time to discuss it on Sunday’s show, but the Hirooki Goto vs. Michael Elgin match from Sunday at Korakuen Hall was excellent. The final 7-8 minutes felt like a classic Triple Crown match from Budokan Hall with several dramatic near falls and great finishing sequence. Mid-way through the match, Taichi ran in with the microphone stand but was chased away by Jeff Cobb, which established Cobb as a major presence being involved in the main event. Elgin went for the buckle bomb late in the match, Goto survived and after several counters, he hit a reverse GTR and then the regular version, which was hit with such impact that it looked excellent. Goto pinned Elgin to regain the NEVER Openweight title after Elgin held it for eight days. Elgin is in the best shape of his life and poised to have a big G1 this summer. I’d place this match as high if not above, any match from TakeOver on Saturday and the drama was incredible. **The episode of Celebrity Undercover Boss featuring Stephanie McMahon from this past Friday averaged 4,158,000 viewers on CBS. **Io Shirai had her farewell match to Stardom on Sunday at Korakuen Hall. Shirai teamed on the show with Mayu Iwatani defeating Kagetsu & Hazuki. Shirai also came out after the main event where Momo Watanabe retained the Wonder of Stardom title over Jungle Kyona and Shirai put Watanabe over to the audience as the big star of the promotion. **Punishment Martinez won the ROH Television title on Saturday at the promotion’s ‘State of the Art’ card from Dallas, Texas. Silas Young was facing Martinez, Cheeseburger, Hangman Page, Scorpio Sky, and Jonathan Gresham in Proving Ground match, where Young would have to defend the title immediately if he lost the match. Martinez pinned Cheeseburger to receive the automatic title shot and defeated Young to win the title. Martinez is scheduled to face Hangman Page at the ‘Best in the World’ pay-per-view on June 29th in Baltimore. **U.K. wrestling historian John Lister has released a compilation of over 50 biographies of performers from the World of Sport series on ITV. The 408-page book features Lister’s biographies that were originally published in Fighting Spirit Magazine and feature biographies of Giant Haystacks, Adrian Street, Billy Robinson, Big Daddy, The British Bulldogs, Brian Dixon, Jackie Pallo, George Kidd, Jim Breaks, Johnny Kidd, Kendo Nagasaki, Mel Stuart, Les Kellett, Mal Sanders, Mark Rocco, William Regal, Robbie Brookside, and many others. It is available for $16.99 in paperback and $6.93 on Kindle. Lister’s book, “Turning the Tables: The Story of Extreme Championship Wrestling” is probably the best-written book on ECW and I’d recommend both. **MLW has announced the following names for their 40-man Battle Riot battle royal match on July 19th in Orlando: Pentagon Jr., Jake Hager, John Morrison, Kevin Sullivan, ACH, Davey Boy Smith Jr., Teddy Hart, Rich Swann, Pentagon Jr., Jimmy Yuta, and Barrington Hughes. The card will also feature a tag match with Davey Boy Smith Jr. & Teddy Hart vs. Rich Swann & ACH.